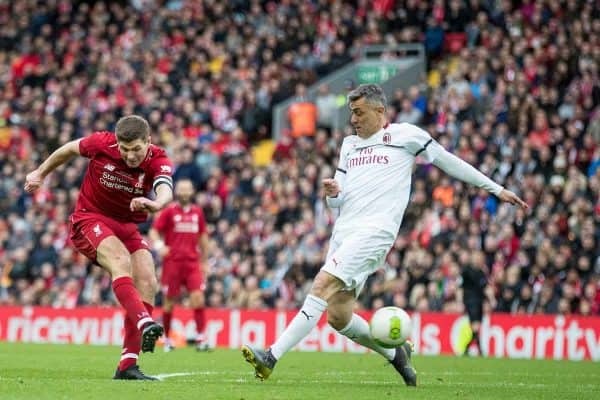 Steven Gerrard made a goalscoring return to Anfield on Saturday, scoring the winning goal in the final minute against AC Milan Glorie. The iconic midfielder rolled back the years as he cut back onto his right foot and angled his shot across the goalkeeper into the far corner at the Kop end. It was a trademark Gerrard finish and a trademark celebration from the former captain. 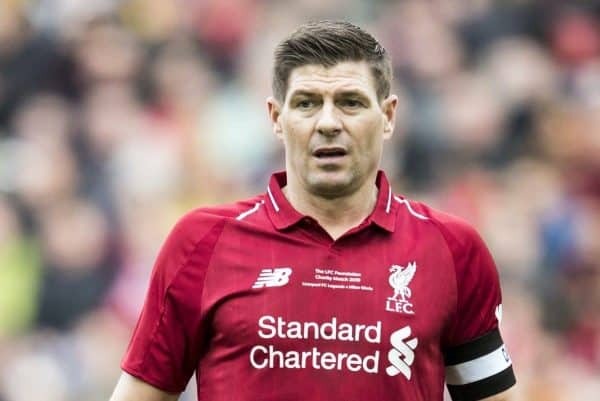 Post-match, the 38-year-old – who left Liverpool four years ago, spoke about the special feeling of being back on the Anfield pitch. “It’s always a special time to come to Anfield, especially when it’s full, and just put the kit on,” he said. Over 50,000 fans were in attendance, raising around £1 million for the LFC Foundation in the process, providing a nice change from the pressure of the title race at Anfield during this international break. Next weekend though it’s back to the action with Jurgen Klopp‘s side hosting Tottenham, and Gerrard admits he’s feeling the pressure as a supporter just like the rest of us.